According to police, a 1999 Nissan Altima sedan and a 1986 Toyota pickup truck hit a pedestrian yesterday morning on Kalihi Street near Machado Street. It started like any other day for 61-year-old Russell Ventura, who woke up early yesterday and left his Kalihi Valley home before sunrise for another morning walk. But this time, he never came back. Ventura died two blocks from his house after being hit by two cars while crossing Kalihi Street just after 6 a.m., according to police. Ventura, who grew up in Hawaii and graduated from Farrington High School in 1963 before moving to Ohio a year later, left behind two children, Darlene Sprinkler and Michael Ventura, who live on the mainland, his relatives said. Ventura was divorced from his children's mother and separated from his wife from a second marriage, they said. In 1997, after serving as an inspector at an Ohio steel factory for 30 years, Ventura came back to live in the house he grew up in, a stone's throw away from Kalihi-Uka Elementary School, which he also attended. "He was a friendly guy. He was my buddy," said his brother, Wayne, 60. "But there's nothing we can do about it. All we can do is pray for him." Agnes Ventura, 91, said her son loved to walk, sometimes leaving the house four times a day to roam the neighborhood. Then he would come back and spend hours watching Animal Planet. "It was a routine. Every morning, he'd leave for half an hour, one hour," she said from her living room, pointing to where her son would sit down to watch his favorite show. "He will be missed." Police said Ventura was walking near a crosswalk when a 45-year-old man driving a black 1999 Nissan Altima sedan struck him. 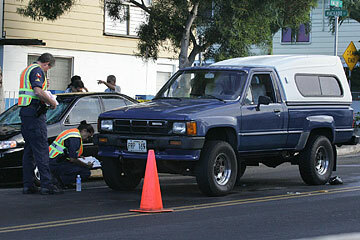 Ventura was then run over by a blue 1986 Toyota pickup truck driven by a 56-year-old man. 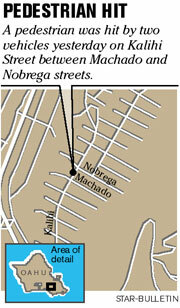 The accident happened at 2305 Kalihi St., near Machado and Nobrega streets. But police noted the road might have been wet from rain and that it was still dark. Police said the driver of the Nissan did not see Ventura, who was taken in extremely critical condition to the Queen's Medical Center, where he died. It was Oahu's 84th traffic fatality of the year, compared with 69 at the same time last year, police said. Honolulu police Capt. Robert Green of District 7 said a task force created this month to reduce traffic fatalities is focusing on curbing speeding, but noted that pedestrians also need to do their part. Since the task force's creation on Nov. 9, its officers have given out more than 2,000 tickets, mostly for speeding, and made more than 50 arrests, with a majority of those being for drunken drivers, said Green, who heads the new group.